THE PATH is a themed semiannual print and ebook/ezine magazine, featuring essays, short stories, poetry, interviews and book reviews. The Path to Publication Group, Inc. is a 501(c)3 nonprofit organization dedicated to the advancement of literacy. We are an equal opportunity organization and do not discriminate on the basis of race, creed, gender, religion or sexual orientation. Path to Publication Group, Inc. 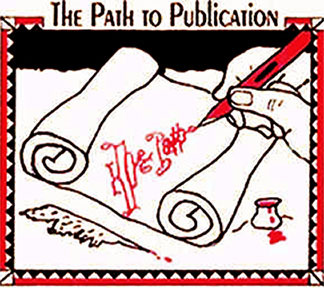 The Path to Publication Group publishes the literary publication – The Path. You are invited to submit short stories, essays, book reviews and poems for inclusion in the semi-annual issues. For more information, please visit the websites: www.pathtopublication.net and www.thepathmagazine.com . Past contributors will receive a call for submissions by e-mail, automatically. Please polish your manuscripts to the best of your ability and, of course, have someone else edit your work before sending to Path to Publication. Do not format your work: no page numbers, no headers or footers, no footnotes; paragraph indentations--use Word auto-indent 0.5, do not skip a line between paragraphs. Manuscripts must be submitted in Microsoft Word or RTF form. Font: Times New Roman - size 12. All submissions must be submitted electronically, as e-mail attachments, to: mjnickum@thepathmagazine.com . The Path to Publication Group, Inc. is a 501(c)3 nonprofit organization that is dedicated to the advancement of literacy.